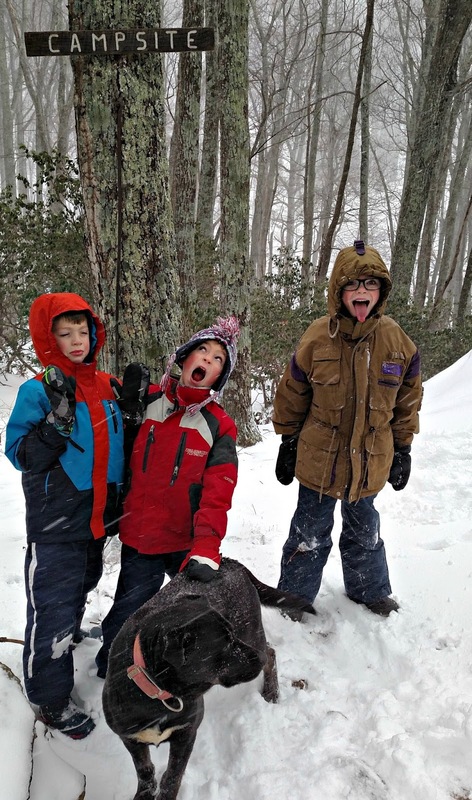 We got a few inches of snow, and the boys talked Paul and I into hiking up the mountain. The snow was blowing all over. At the top, we found three black dogs. Not ours, and wearing collars without names. They were friendly and well-fed though. I bought snow shoes with my Christmas money this year. They strap onto my snow boots. The are long and grip the ground. Excellent for going up steep mountains in snow. I didn't slide once. As I write this, I'm getting a little tired of winter. I'm looking forward to garden season! That black dog looks suspiciously like our Murphy! :) I'd enjoy trying out snowshoes sometime! I'm ready for spring too...snow is beautiful, but so is green grass, freshly tilled dirt and a happy garden. I'm thinking of getting snow shoes for exercise - but maybe next year. Like you, I"m getting tired of winter too. Bleh. I hope you don't have to wear your snow shoes for a long time. I have a pair of snow shoes but haven't needed them for a few years but they really do work. We went on a snow hike after school yesterday, too. Just not in the mountains! I was just thinking how nice it would be to go out and pick a tomato.I like your shoes, we haven't had enough to ski here much. ...winter is great, but so is spring. Love the photo of your sweet boys, Lisa. Hi Lisa, First of all, Happy New Year 2018 to you, Lisa, family & beloved ones! I don't like Winter Season. I guess it's a good idea to wear snow shoes to walk in the snow. When I was in my teens, I used to sky in the mountains. I prefer middle seasons, especially Spring Time. I don't like hot weather either. Since I live in S.A., I have to put up with killing hot weather, which is too bad for my health. Hubby & I make plans to relocate back home with my family in New York. Well, your adventures with your beautiful children are amazing. Your Blog is Unique & Special, one of the best ones around. You are also a great mom, Lisa. All the very best for you, your dear family & loved ones. I'm always glad to go back to your Blog, and read your updates with your precious children. Until we write again. Greetings from Poet Starry. This picture of the boys is priceless! Looks like they are loving the dog, too. So they found three friends at the top. Were the snowshoes heavy or hard to walk in? What fun! Brrrr- just brrrr! It looks like fun from afar, but I, too, am ready for the cold to leave. We don't ever get much snow so I can't complain about that. I had enough of snow growing up, but sometimes miss it. I can't imagine why....it is cold and wet, and I am too old for it to be fun anymore. Love your new horse Sima- so pretty, and I hope Pierce continues to love riding. Oooh, I want snow shoes!! We have not had a lot of snow this year, but it has been cold, so off to the gym I go. :( Enjoy the fun outside exercise. It must be so cold there. Wow snow shoes! I don't think you could even buy a pair of these in Ireland!! Did the dogs follow you home? Love that you got something to prevent slipping! Cool snow shoes! Nice to have for the rare times you need them. Hiking in the snow is very peaceful. I don't do it anymore, but I enjoyed it immensely when I was younger. 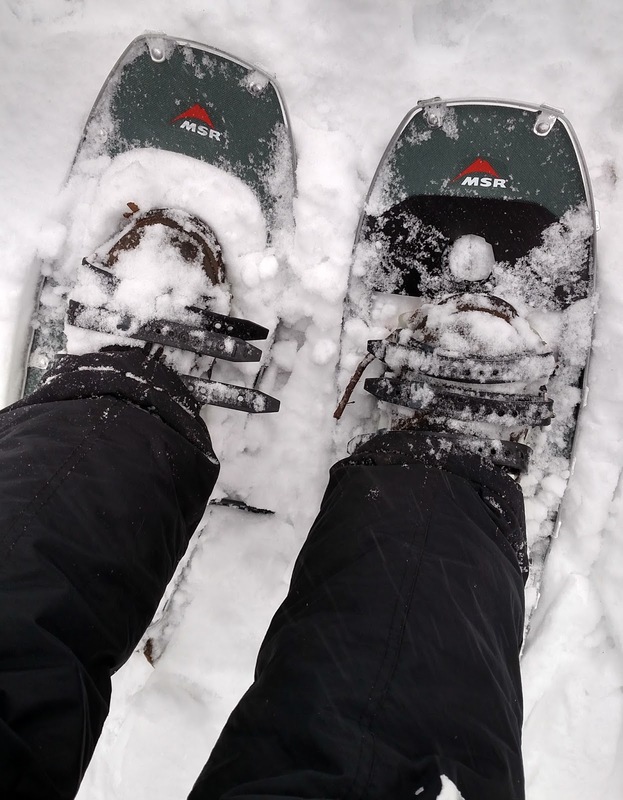 I have never tried snowshoeing- though it looks like fun (and yours look very different than the ones I imagine). Glad you guys got out for a hike in the snow. I am ready for spring and the garden too! It looks so cold tome yet welcome too as I live in a tropical country- hot and humid all year around. How funny that you had a snowy hike, and we barely have any snow at all. In fact, in the last three weeks, we haven't seen any weather events. We've had some rain and some 20 degree days, but most have been in the high 30's to 40's. I would LOVE those snow shoes. Before Lewie, I used to go hiking every weekend, snow and all. It snowed here yesterday and today. Someone hit me as I was stopped. They turned a corner, and BAM smacked into my car. I'm glad those shoes work well. It's fun to go hiking. Glad the dogs were friendly. I like your snow shoes. Glad you got out for a walk.